On this day in history, November 27, 1773, the tea ship Dartmouth arrives in Boston Harbor. This was the first of three ships in Boston that would be involved in the Boston Tea Party. Taxes on tea was a longstanding issue between the colonists and England. The Townshend Acts of 1767 taxed five items: glass, lead, painters colors, paper and tea. The Townshend Acts actually had the effect of lowering the price of tea in the colonies, because it removed a duty paid by the British East India Company, allowing them to sell tea more cheaply. The colonists, however, were not inclined to pay any tax and boycotted British goods until the taxes were repealed in 1770... except for the tax on tea! 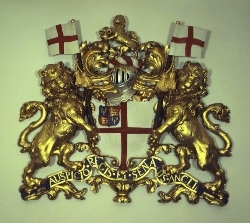 The British East India Company fell into serious debt and Parliament tried to help with the Tea Act of 1773, allowing the Company to ship its goods directly and more cheaply to the colonies by bypassing the middlemen in England who raised the price. This arrangement would save the British East India Company from bankruptcy because it would sell more tea and it would still affirm Parliament's right to tax the colonies because the tea tax was still in place. Once the Tea Act was passed, the Company sent tea to several American ports. The tea never landed in New York or Philadelphia because patriots wouldn't allow it to be unloaded and the ships returned home. In Charleston, the tea was confiscated and resold to fund patriot activity against the British. More dramatic events unfolded in Boston. The Company had sent four ships to Boston. The Dartmouth arrived on November 27th, but colonists wouldn't allow it to be unloaded. Two other ships arrived over the next two weeks and the fourth was lost in a storm. Patriots posted sentries to make sure the tea wasn't unloaded. By law, if import duties were not paid within 20 days, the ships and their cargo were to be confiscated and sold to pay the duties. Consequently, Governor Thomas Hutchinson would not allow the ships to return to England, which the owners and captains had volunteered to do. The deadline for the confiscation was December 17. The colonists wanted to prevent the confiscation and sale of the cargo and ships since the money would still be used to pay the unjust taxes. This is the reason they picked December 16th for the Boston Tea Party. After a rousing meeting at the Old South Meeting House, several thousand citizens marched to Griffin's Wharf where the ships were docked. They cheered as dozens of men, some disguised as Indians to protect their identities, boarded the three ships and dumped 46 tons of tea into the harbor, so much that the water was brown for a week! Parliament’s response? 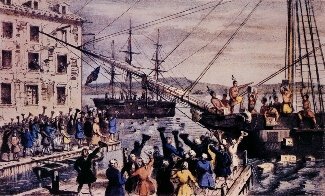 To shut down the government of Massachusetts and close Boston Harbor until the tea was paid for. This response led directly to the colonists' forming of the First Continental Congress to create a unified colonial response to these Intolerable Acts, and to the outbreak of the American Revolution.